Just call in to watch Fiona spin and ask her any questions you may have. If you are interested in the workshops then please email, or call in to the shop, as we have limited spaces. Drop in Sessions – will be taking place every Wednesday morning starting on January 13th, free-of-charge at the Coco Alpacas shop (9 High Street, Church Stretton) between 10.30 am and 12 pm. These slots provid an opportunity for people to come and talk about their current knitting or crochet project over a cup of coffee. Beginners Crochet and knitting sessions will be held on Wednesday afternoons at the shop between 1.30 and 3.30 pm starting on January 20th. The first session will be dedicated to beginners crochet and the next session will be beginners knitting. We will continue to alternate crochet and knitting throughout January and February. These are taster sessions to learn the basics and you can progress at your own pace. Please bring your own crochet hooks, knitting needles and yarn; if you don’t have these essentials then we are happy to supply them with a 10% discount on the normal price. The charge for the 2 hour session is £15 and each slot is for a maximum of 4 people. Weaving Demonstration – Fiona Nisbet will be staging a weaving demonstration on Thursday January 21st, from 10.30am until 3pm at the shop. Fiona will show us how to warp a Samplelt loom and a Knitters Loom and explain the process of weaving simple weaves. If you are interested in weaving then please do come along. Beginners Sock Workshop – Taking place on Friday January 29th from 10.30 am – 2.30 pm at the shop. This workshop will demonstrate a step-by-step process of how to knit a sock. At the end of the day you will come away with a completed miniature sock! Please bring your own needles and yarn – if you don’t have them we can supply giving a 10% discount. The price of this workshop is £40 and includes tea, coffee and a sandwich. Max number of people is 3. This workshop will be repeated on Friday February 26th. The shop will close for Christmas from Christmas Eve lunchtime at 1.30pm and will re-open on Monday 4th January 2016. I’m pleased to announce that the winning name for our wooden alpaca in the shop window is ‘Andy’! There were two winners, Trish Howard and Thelma Thompson, both from Church Stretton. Wizard and Derby (2 alpacas) will be in the square, High Street, Church Stretton for the opening from 10am – 1pm! 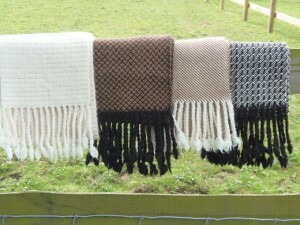 I have got some beautiful stylish woven scarves which would make wonderful Christmas presents. This is Gina born 23.10.14 – a bit late in the year, but she is doing well. 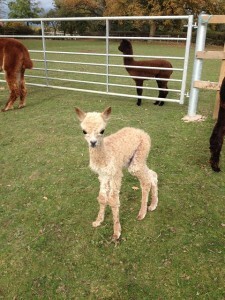 The females that were all expecting this year have produced lovely healthy cria & couldn’t be more even, 2 boys & 2 girls!